I've been thinking about how our families sometimes fail to offer the support we need ---or even acknowledge we need support--- a lot lately. I've been hearing a lot from others who struggle to find a place in their families and struggle to feel understood. I thought my family was coming round to me have gastroparesis and dysautonomia. Boy, was I wrong! I've heard they dread talking to my mom & seeing us at family events because 'there's always something going on'. Turns out my family thinks it's just so darn hard to understand everything that's been going on with me. They all think I just keep making up new diagnoses & change what's wrong with me whenever I feel like it. Well, I first thought about sending them a last resort email explaining everything 1 last time, in the hope of making family gatherings a bit more fun. Turns out, I can do 1 better and write them an open letter. I'm pretty much over your sh*t right now. Yup, I said it. O.V.ER. It's been almost 5 years since I had to leave school because my body just couldn't take it anymore. I tend to say 'since I got sick' because that's how it feels for me, but my body wasn't coping before that. Like many others with my condition (we'll get to diagnoses a bit later), all of it was just chuffed aside as 'growing pains/spastic bowels/just being a girl/whatever. 5 years ago was when everything really fell apart. I mean, one time I took the bus home from school & couldn't remember how I ended up at my front door, keys in hand. It was one big mess from the start, talk to anyone with my condition(s) and they'll tell you the same. No one gets to a decent diagnosis without going past a few doozies. The first 2 years (give or take, time gets muddled up when you have a chronic condition) I spent going from doctor to doctor, hospital to hospital; first a local hospital, then a big university one. All the poking and prodding seemed to point at CFS/fibromyalgia, I know you're not familiar with chronic condition land but they can be doctor speak for 'no idea, shut up'. They are propper diagnoses so no hating on people with CFS & fibro but it didn't make sense for my symptoms. You seem to feel like I just typed in some symptoms & ended up somehow with this completely random thing you've never heard of. I was really lucky to see a tv show where they interviewed a girl with something called gastroparesis. Her case was more severe than mine but the story made sense. Around the same time, I came across a woman called Crystal Saltrelli. She was an AADP certified health coach and had had gastroparesis for many years. I started reading her articles on gastroparesis and I emailed her for advice. She gave me some information on how to get properly tested for gastroparesis and I took all of her stuff to my gastroenterologist at the time, asking for a gastric emptying scan. Turns out, my stomach was extremely slow & struggled to digest food. Now I know why, but at the time they figured it was just related to the CFS. I started working with Crystal to get my GP symptoms under control. While working with her, I started on the low-fodmap diet and found out I had gluten intolerance. All of this worked, but still didn't explain the other symptoms that weren't caused by the GP or malnutrition. Because of Crystal and all of the ways she helped me, I felt I wanted to help others in the same way she helped me and, with my background in food already, I decided to apply to the school she studied at to become a health coach. I was so happy when they accepted my application! I started the course and learned to stand up for myself and always do what I felt was what I needed to do, not for anyone else but for me (in the end that benefits everyone but that would take us too far for this letter). I wouldn't have written you this letter if it wasn't for the brave stuff I had to do to complete my training, I mean, I once coached a woman over Skype I barely knew and we spoke for over 3 hours. Working with Crystal, I met the most wonderful group of woman who all became close friends. It was because of them I got where I am today. Last winter, several of them started being tested for a condition called dysautonomia. They talked about their new diagnosis, treatments, symptoms... and it all fit with my experiences with my condition so I went to my doctor and asked if he thought testing me for it was worth a shot. He agreed and the test results came back positive. It took me several months to recover from the Tilt Table Test but I officially have dysautonomia, a condition caused by malfunctioning of the autonomic nervous system with symptoms that are like a checklist of everything I've ever had. Good thing was, there are treatments. I take Florinef (a type of cortisone, so no comments on my body and weight, please) and saline infusions (I've written lots on saline on the site, so feel free to have a browse). Having to recover from the tilt table test meant it got harder to finish my health coaching training, but I made it! I graduated July 14th of this year (2015). How cool is that?! With the dysautonomia diagnosis, I finally knew why my stomach doesn't work (resulting in the gp). In my case, there just isn't enough blood to make everything work in my body and digestion is the first thing your body shuts down when there's not enough blood to go around. So, if you're still wondering why all the different diagnoses? We'll they're not different, they all work together and are all a different piece of the puzzle. I hope this makes everything clear for you and we can start by you treating me with the respect I deserve, because if it wasn't for me spending hours online and pushing for tests and treatments, time & time again, I would've had absolutely nothing and my life wouldn't look like this at all. Think about that, next time you tell me I need a kick up the but, see a shrink, get real, stop complaining, get tough ,or any of the other crappy things you've told me (my mom, my brother and sister, behind our backs) over the years instead of trying to understand or care. 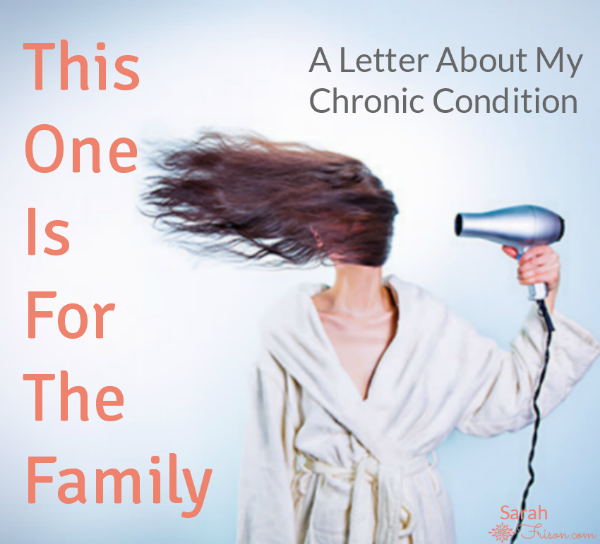 I don't want to share this letter to get sympathy votes or to make a scene (not quite being honest with that 1 :P ) but I want to try and shed some light on how people with chronic, invisible illnesses can be treated by their families. I hope by sharing this, others will think about how they treat their relatives, and I hope it helps others who's families struggle to understand their condition. What's the difference between a best-before and sell-by date? Is health coaching any good when you have a chronic illness? I'm now taking one on one clients!